How can leverage the ubiquity of mobile applications to shift societal perceptions of barefooting? Barefooting has many benefits in the context of rewilding humans and our environments. There are four primary value propositions that I have identified. The first is the one with the most literal sustainable impact: by not wearing shoes we require less material waste. The second value proposition involves proper gait. There have been studies that show that barefooting, and the associated increase in nerve responsiveness from the nerves in the feet, aid the body in adjusting to a more proper gait. This can often help people’s ankle, knee, and spine health. A third value proposition involves the topic of “earthing.” While the science of ion exchange between human bodies and the earth is heavily contested, some of my interviewees say that the phenomenon of earthing is actually about bacterial exchange. By going barefoot, we can exchange bacteria with the earth, which helps to balance and increase biodiversity on the surface of our skin. Finally, when walking barefoot you are required to pay much closer attention to the ground, to avoid stepping on something harmful or unpleasant. This heightened attention to the surface of the earth can increase awareness of how horribly we treat it. When I walk barefoot, I see every piece of trash, and this builds my empathy for the earth. In many cases people are fearful of going barefoot because of perceived risks to safety and health. People are concerned that it’s too dirty or that they’ll get an infection. But unless we have an open sore, this really isn’t a concern. Feet are very resilient. I wanted to create an app to help spread the word of the health benefits and safety of going barefoot, and to begin to normalize this behavior. I spoke with Sue Kenney, founder of Barebottoms shoes - a sole-less sandal for barefooting. She told me about the need to balance barefooting on concrete and barefooting on soil or grass or gravel. My interviewees had mentioned that they actually enjoy walking on a diverse range of textures throughout the day because it adds another level of enjoyment and adventure to barefooting. With all of this in mind, I created Barely, a digital platform for barefooters. Barely aids in converting non-barefooters as well as supporting existing barefooters. It identifies different textures, recommending ways to balance your exposure, and creates community around favorite routes and barefoot-friendly businesses. The Barely app contains four functions: Transition, Balance, Scout, and Connect. Users ease their way into barefooting through a series of exercises. These include going barefoot at home, acquiring a first aid kit, walking to work barefoot for the first time, and visiting a store or restaurant barefoot for the first time. Users track the different types of surfaces they walk on each day and receive recommended routes to maintain a balance towards their desired goals. This functions through the GPS on the phone or any other connected/wearable device. In the near future when Barebottoms shoes releases the Internet-of-Things version of their barefoot shoe, users can connect with that to further track their data when they’re not carrying their phone. Users aid in data collection by exploring territory that is not yet mapped and providing information on the textures. This then feeds into the data used in Balance. Users view preferred routes and businesses of other barefooters in the city through an interactive map as well as through user profiles. They also add their own preferred spots and routes to share with their friends. 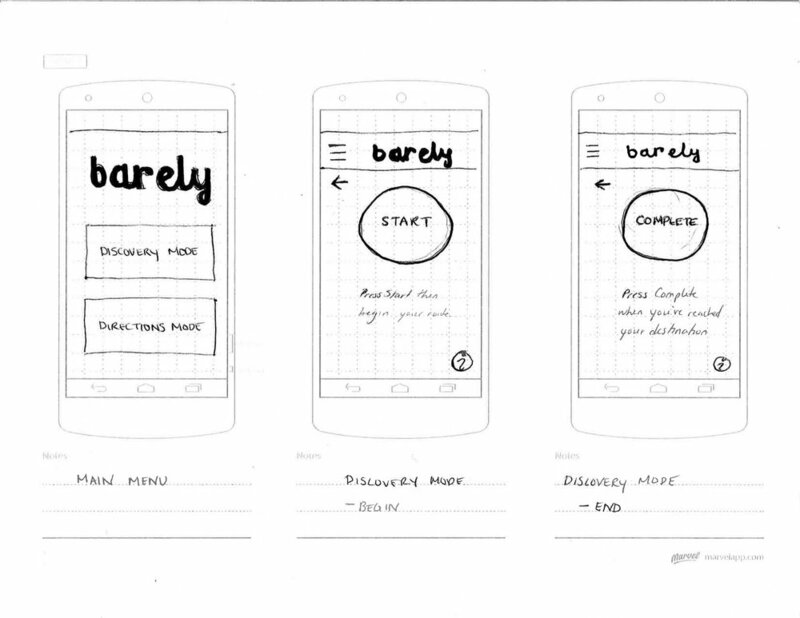 The initial idea for Barely came out of the screens sprint in the first semester of thesis. Originally it was about textures and hazards on the streets. However, after engaging in user testing at the beginning of the second semester with experienced barefooters, they raised questions about the hazards features. They said that they were not worried about this aspect of barefooting and the most relevant feature to them would be ratings of barefoot-friendly businesses. I quickly recognized this discrepancy between the needs of beginners and the needs of experienced barefooters. But I couldn’t create an app exclusively for experienced barefooters, as my larger thesis goals involve conversion. I edited the UX to create more of an arc or flow through a series of features: Transition, Balance, Scout, and Connect. Another integral part of the process was partnering with Sue Kenney. She is the founder of Barebottoms shoes, and is currently working on both an Intro to Barefooting book and a GPS-enabled barefoot shoe. We discussed ways to integrate her projects with this app. Her shoe could easily connect with the Balance feature as it could track the routes a user takes, and then feed into the app tracking of the surfaces explored.